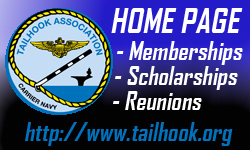 Tailhook Daily Briefing: USS Midway A-6 Dedicated to a Special Intruder Crew! USS Midway A-6 Dedicated to a Special Intruder Crew! This past Friday, many supporters of the Intruder community gathered on the flight deck of the USS Midway Museum under a blue San Diego sky to dedicate the A-6 on board in the name of a very special flight crew. 37 years ago on a Mid-January evening, VA-115 “Arabs” aircrew Lt. Mike “Mondo” McCormick and Ltjg. Alan “Arlo” Clark, were catapulted from the very same USS Midway, flying “Arab 511” and were soon “Feet Dry” over the coast of Vietnam. They were on a SAM and Radar Suppression mission in support of B-52’s on a Linebacker II operation, they were never to return. That night Mike and Alan would become the last Intruder Crew to make the ultimate sacrifice in that long war. President of the Intruder Association, Capt. Larry Yarham USN(Ret) presided over the dedication, with comments by USS Midway Museum President RADM John “Mac” McLaughlin USN(Ret), the former CO of VA-115 Capt. Paul Barrish USN(Ret), Mike’s Sister Jaime, and Alan’s son, Lt. Col (select) Tad Clark USAF. One final trap. . .
Just over 6 years ago, many of us gathered in the Arlington National Cemetery on a cold, snowy, January day in Washington DC, to honor two men who gave their lives in the service to their country. On that day, we faced their casket and saw the thousands of tombstones precisely lined up in countless rows behind it. To our back, however, was a remarkable thing. It was an open plot of land unmarked by the granite reminders of those fallen. Today, I’m sad to report, that section of land looks quite different. I share that with you as it serves as a reminder that our nation is still active in our national security and interests abroad to include the liberation of those subjected to oppressive rule. That commitment requires us to send those who are willing and able to serve, even if it means placing them in harm’s way. That is the spirit of patriotism, heroism, and selflessness we remember today as we honor LT Mike “Mondo” McCormick and LTJG Alan “Arlo” Clark. On 10 January 1973, “Mondo” and “Arlo” were catapulted from the bow of this very carrier, the USS Midway. While reporting “Feet Dry”, their mission would all too soon be short one “Feet Wet”. And so, the many long years of wondering and mourning began. Their names were placed on the Vietnam War Memorial, the wall, as our nation recognized they were “Gone But Not Forgotten”. When “Mondo” and my father were laid to rest in Arlington 31 years later to the day, then began for many the closure and healing process concerning their sacrifice. That was certainly a significant day for all of us. But today is significant too as this A-6, in a sense, represents “Mondo’s” and “Arlo’s” determination and resolve to wrestle their battle torn Intruder back aboard the deck of the USS Midway for one final trap. As their names on the wall and on their tombstone in Arlington provide time for reflection, respect, and remembrance. . .their names on this combat proven A-6 Intruder celebrate the lives of two great warriors, their heroism, will retell their story for countless years to the millions of visitors aboard the Midway, and will remind us of where they loved to be, in the cockpit soaring in the skies above. God Bless You, Mike and Alan… and all who gave all.